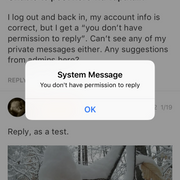 I log out and back in, my account info is correct, but I get a “you don’t have permission to reply”. Can’t see any of my private messages either. Any suggestions from admins here? What version are you using yes2matt? zweefer, are you still experiencing issues ? also you posted a link underneath your photo; 'minus', not sure but the link just takes us to ImgBB's home page to upload images? It seems to be fixed now! If you did it, Thanks!!!! I know I am not the o my one who prefers to check in via mobile. 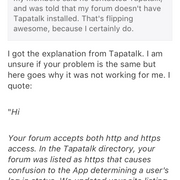 I just updated the tapatalk forum plugin to the latest level.